Hi! Soooo have you been playing along with The Daily Marker 30 Day challenge for this month? This is one of my absolute favorite challenges because, let’s be honest, I love to color, and any excuse to color every single day is totally something I can get behind. Another perk: gives me a reason to play with stamps that are not for an assignment. I get to just play because I wanna. 🙂 Case in point: The Wreath of Roses set from Lil Inker Designs. This set is a new one for me, and I have to say… it might be one of my absolute favorite Lil Inker sets. It’s gorgeous. To start, I die cut and heat embossed that beautiful floral wreath from Wreath of Roses using Platinum embossing powder onto Arches Cold Press watercolor paper. Next, I watercolored the pretty florals using my Daniel Smith watercolors in shades of Nickel Azo Yellow, Buff Titanium, and Quinacridone Coral. (I decorated our mantel with some fall decor last week, so I’ve had autumnal color schemes on the brain!) Love this color combo! After I had finished watercoloring, I wanted a simple layout, so I simply popped up the wreath with dimensional foam tape onto a creamy linen card base and added a die cut platinum shimmer Thanks from Papertrey Ink’s Big Basics line. The final touch was a double twine bow adhered with some Multi Medium Matte. Well, that’s it for my first project using the spoils of the Daily Marker 30 Day challenge. If you are new to my blog, I will (be attempting to) post daily for the challenge on Instagram, so follow me @eamidgett to see my future projects! Thanks for stopping by, and have a marvelous day! Good morning! Today is a bittersweet day for me and my little family, one that we’ve been simultaneously longing for and dreading. We’ve had our house on the market since last July, and after a long and tumultuous road, today the new owners take possession. This little house has meant so much to my husband and I. We bought it in 2008 and completely remodeled the entire thing, from the stud walls out, so every cabinet, every light fixture, every faucet holds sentimental meaning, because with each new addition, it meant we were one step closer to it being finished. It truly was our first home, in so many senses. We got our first (and only) positive pregnancy test in that house after longing for a baby for years. We brought our babies home from the hospital to that house. We watched them do all of their major “firsts” in that home. Seeing them in their empty room was a little heartbreaking. But, the silver lining in all of this is that the couple who bought the house seem to truly love it and are so excited to live there. I wanted to do something special for them, so I created a card to leave with a little message inside. I’ve been waiting to use these stamps and dies from Lil Inker since last Christmas. I am superstitious enough, especially after the tumultuous time we had selling the house, that I didn’t want to jinx it by making the card too early. I started by die cutting and stamping all of the floral bits from the Warm Welcome set from Lil Inker. 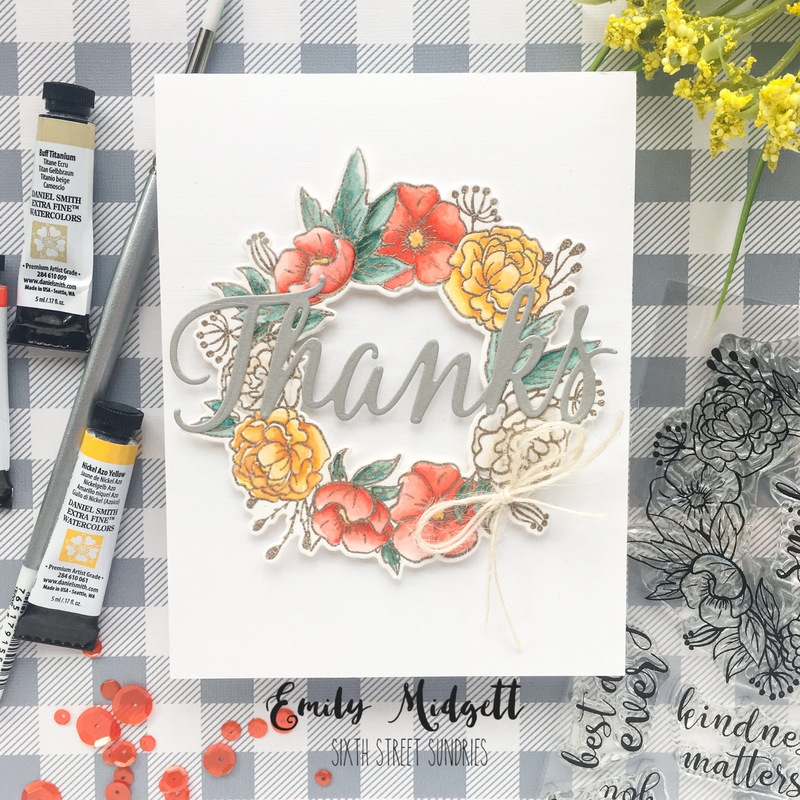 I used the beautiful Rose Petal inks from Altenew to stamp the pretty blooms, while the foliage was stamped using Altenew’s Mountain Mist and Lagoon inks. I die cut the wreath from some smokey gray card stock that I had on hand, then die cut the coordinating “Welcome” die from Lil Inker twice, once using white card stock and once using some black glittery paper from my stash. For the blue background, I die cut one of the stitched rectangles from The Ton’s Double Stitched Rectangle dies from some pool colored card stock. I then used one of the floral centers to stamp little random white dots all over the blue panel, just to give it some interest. I adhered it to the white card base, then adhered all of my die cut pieces using a combination of liquid and dimensional adhesive to give plenty of dimension. We took the card, along with some homemade banana bread and a mason jar of pretty pink flowers, and left them on the counter of their new home last night. I truly hope they are as happy there as we were. I know that we are moving on to bigger and better, plus we are a lot closer to hubby’s job, so he can be home with us more, but it’s still sad to see the rooms so empty, with no toys littered everywhere and no kids running around.